The Book Club: Chinese Martial Arts by Peter Lorge, Introduction-Chapter 5: Reconstructing China’s Ancient Military Institutions. 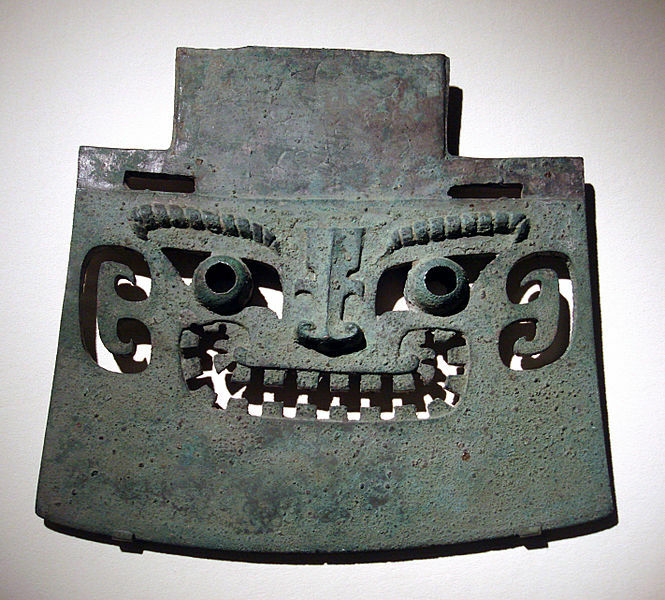 Ancient Chinese anthropomorphic battle ax, Shang dynasty. This ax was excavated in modern Shangdong in 1956. It is the same as the axes that Lorge discusses extensively in the first section of Chapter 1. Axes were used on the battlefield. to dispatch prisoners and as a symbol of military command. this ax was likely buried with a wealthy individual from the period. Source: Wikimedia. Introduction: A Breakthrough for the Field of Chinese Martial Studies. The “Book Club” is a semi-regular feature at Kung Fu Tea in which we collectively read and discuss important works in the fields of martial studies, history or the social sciences. Each of these works either has made, or is expected to make, a significant contribution to our understanding of the Chinese martial arts. Our goal is to attempt to really engage with the academic arguments made by a given author. We try to keep the level of discussion at the advanced undergraduate level, so no prior background or language expertise is necessary to participate. Just be sure to get a copy of the book and keep up with the reading! The first volume we reviewed was The Shaolin Monastery by Meir Shahar’s (Hawaii University Press, 2008). If you have not checked it out yet, you might want to take a look at it. The current review will follow the same multi-post format. As promised, the next study on our reading list is Peter A. Lorge’s study, Chinese Martial Arts: From Antiquity to the Twenty-First Century. This work, published in 2011 by Cambridge University Press, is a true milestone for the field of Chinese martial studies. It is one of the few University Press books which attempts to deal directly with the Chinese martial arts, taking them on their own terms, and not subordinating this research to some larger goal (such as the investigation of Chinese nationalism or identity). Douglas Wile’s Lost Tai-Chi Classics from the Late Ch’ing Dynasty (SUNY 2006) and Shahar’s previously mentioned volume pretty much round out this list. Aside from any argument that he might advance (and the book contains quite a few worth careful consideration) Lorge’s efforts represent a huge step forward for the field of Chinese martial studies. Projects of this quality are what is needed to attract more attention to the field’s research and to demonstrate that a familiarity with the history of the various fighting arts and military traditions may be necessary for dealing with a wide variety of historical, cultural, sociological and economic problems that arise in the field of Chinese studies. The value of Lorge’s work goes well beyond its academic implications. I expect that most of the individuals who actually purchase and read this volume will be martial arts students, rather than undergraduates in a Chinese military history seminar (though I would not hesitate to use this text in my classroom). Lorge’s volume provides the sorts of easily accessible explanations and arguments that have long been missing from popular discussions of Chinese martial arts history. The author marshals a large number of important historical sources to support his arguments. This allows him to paint a convincing and realistic picture of China’s military landscape at various points in history while exploding many of the myths and misconceptions that have grown up over the years. Better yet, Lorge manages to do this in the nicest, most reasonable, way possible. This is a critical skill when attempting to introduce general readers to a very different view of a subject that they often suppose that they are already experts in. I can testify from my own experience that tactfully bursting bubbles is not always an easy thing to do. Yet The Chinese Martial Arts is written in a clear, easily understood, style that makes the task seem effortless. Lorge limits the use of obscure terminology or allusions, while still engaging in discussions that are critical to the historical field. This is one of those rare books that can make a contribution both within the university classroom and the training hall. On a more personal note I wish that something like this had existed when I was starting to investigate the field. Most of the information in this volume can be found in other places, but putting it all in a single place is a real gift for future students. While I occasionally disagree with Lorge’s conclusions (this is not surprising as he is a historian and I am a political scientist), I would not hesitate to recommend this book to anyone who is interested in learning more about the ancient history of the Chinese martial arts. Zhou period bronze “ge” or dagger-ax. 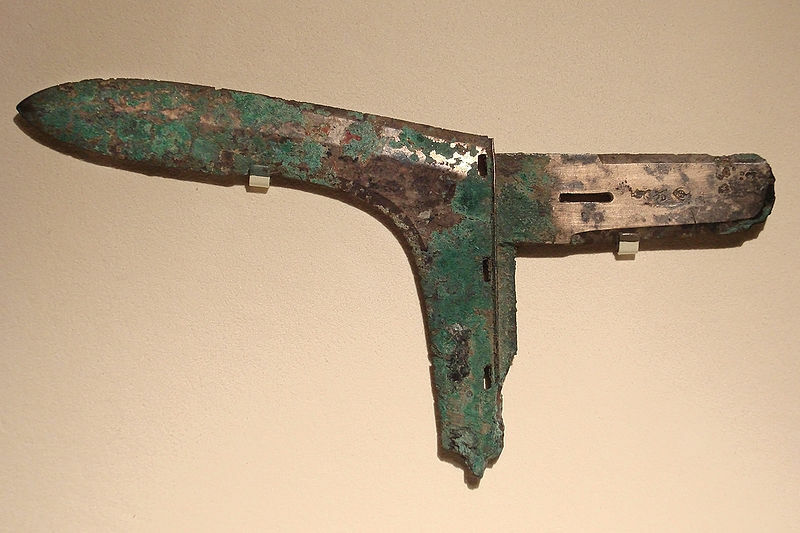 These weapons could be mounted on either long or short poles and were the most common battlefield weapon in Bronze Age china. Their use may even date back to the neolithic period. Lore discusses this weapons extensively in the first half of his book. Source: Wikimedia. Lorge’s Approach to Chinese Martial Studies: Basic concepts, methods and the question of continuity. From a scholarly perspective the “Introduction” is one of the most interesting parts of the first half of this book. Here we see Lore define his approach to martial studies and discuss what this book will, and will not, cover. Among the more important aspects of this discussion for the popular reader is his basic review of the politically complex, rapidly evolving, vocabulary used to discuss the martial arts in the Chinese language. While “wushu” is the most common term for the martial arts in the Chinese language today, it is not the only one that the reader is likely to encounter. “Quanban,” “guoshu,” “kuoshu,” “wuyi,” “gongfu” and of course “Kung Fu” (most often encountered in vernacular English) will all be seen in historical research or casual reading. His discussion of these terms is brief and helpful to the beginner, though anyone seriously engaged in the study of the Chinese martial arts and globalization would require a much more detailed and nuanced discussion of some of these same terms. Other topics covered include a basic discussion of how we define the “martial arts,” and how one deals with the reoccurring issue of “authenticity” in the various schools of hand combat. Kai Filipiak devoted much of his previous assessment of the state of Chinese martial studies to these same questions, and it is useful to sit down and carefully analyses the positions of the two authors. For instance, Lorge starts his investigation of the Chinese martial arts with an archeological discussion of the technology of Bronze Age warfare. He demonstrates quite convincingly that something very much like the martial arts that we know today probably developed at an early point in time. Dagger-ax fighting and chariot combat were complex skills that took years to master. These same skills seem to have been taught and employed in other social realms as well. The royal hunt employed many of these basic technologies and was part of the same sacrificial complex (that included warfare) which helped to define Shang society. Martial dances were performed for both ritual and entertainment purposes using the same weapons that were found on the battlefield. Further, individuals valued the mental and psychological side-effects of intensive archery training among the Shi (knights) of ancient China. Wrestling contests were even popular in the distant past and were promoted and supported at times by the government. Still, the fundamental question remains. Are these activities in any way connected to modern Chinese martial arts? This is precisely where Filipiak seems to have trouble with at least some of the existing literature. It is very hard to convincingly draw the lines connecting all of the dots which span the millennia. In all honesty, something like wrestling or boxing is not that complicated a concept. Lots of societies have independently created their own combat sports. For a society that has existed as long as China, it seems likely that ideas about boxing may have been created, forgotten, and then recreated many times in the past. So, if I am attempting to understand the history of the Chinese martial arts, should I start my investigation at the dawn of the Chinese society, or would it make more sense to begin in the Ming dynasty, when the precursors of most of the modern martial arts actually came together for the first time? This is not a purely theoretical question. The reality of academic publishing today is that most university presses are going to be very cautious about accepting a 400 page manuscript. That’s not to say that enormous tomes never get published. But the longer a book is, the more expensive it becomes, and the less likely it is to be profitable. For that reason there is a lot of pressure on younger scholars to keep their works of a reasonable length. So given that you have 200-250 pages of text to work with, how do you want to use them? Lorge seems to be acutely aware of these constraints. Topics that are not germane to his story are excluded from the discussion. He does not spend a lot of time reviewing basic Chinese political history. Nor does he talk much about the evolution of the social, economic and religious framework that military history is inevitably embedded in. The reader is expected to bring that sort of basic historical knowledge to the table. One notable absence in all of this is any discussion of the links between the martial arts and Daoist philosophy or longevity practices in ancient China. Modern martial arts such as Taiji, Bagua and Xingyi Quan are all closely tied to concepts of Qi and Qigong practice. Modern readers might reasonably ask what relationship, if any, the ancestors of these arts had with the precursors of Qigong. While Qigong is a new phenomenon, dating from the 1950s, other forms of Daoist gymnastics and breathing exercises have been very popular in the past. In fact, these sorts of practices were quite popular during the Ming dynasty, when the actual ancestors of the modern martial arts were being pulled together. Shahar has argued at length that it was a combination of unarmed fighting forms with Daoist medical ideas and gymnastic traditions that is responsible for the rise of the unarmed martial arts as a new, and substantially unique phenomenon, at this period of time. Lorge does not directly engage Shahar or his findings anywhere in his introduction. He does seem to accuse Shahar of intellectual dishonesty for not forthrightly stating that Shaolin was a marginal institution that had no substantive impact on the development of the martial arts. Yet to be totally honest, I don’t think that this is how Shahar reads the evidence at all. It turns out that small differences in how you define your basic concepts (like what a “martial art” is) can have a large effect on what you end up concluding. That is precisely why Filipiak’s call to have an actual conversation about these foundational ideas and concepts is so important. Rather than debating directly with Shahar (in the introduction), or modern students of the internal martial arts, Lorge makes an argument about not misusing the historical record. He states that while we know that ancient Daoist practices existed, and that these may look superficially like modern practices, it is hard to pinpoint their actual content and meaning. Most of the texts that we have are cryptic. Sometimes they are intentionally obscure, hiding the “trade secrets” of the craft. Ergo it is logically impossible to conclude that there is a definitive link between modern Qigong practices and ancient Daoist schools. For that reason Lorge skips over the discussion of the connection between the martial arts and ancient health or mystical practices. 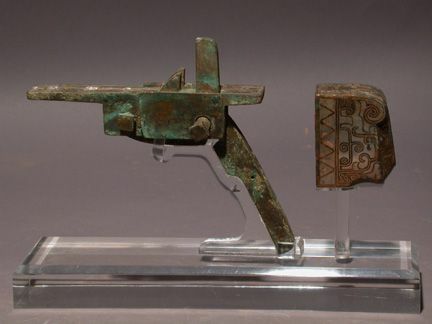 A bronze crossbow lock from the Waring States period. Source: Wikimedia. This is all true, and good so far as its goes. Yet taking this argument to its logical conclusion, it seems to apply to just about every topic in the first half of his book. Sure there is a connection between modern opera and the martial arts. And it appears that there was some sort of superficial connection between the fighting arts and public performance in the Han dynasty. But this isn’t a subject that we know much about. Actually, when you get right down to it, we know very little about the ancient martial arts of the Bronze Age or the Early Imperial Period. We have a smattering of archeological evidence, some book titles, the occasional engraving or literary reference…and that is it. All of this information is cryptic, sometimes intentionally so. Why should we assume that what these individuals did had any sort of relationship at all with what any serious social observer would call the “Chinese martial arts” today? In short, you would not. The easiest thing to do when attempting to understand why Lorge structured his book the way he did is to note that, at the end of the day, he is a military historian. Historical continuity is probably not a central concern of his. That is the sort of thing that practitioners who want to defend lineage mythology care about. Instead he is interested in specific technologies of violence, how they were used and passed on. This is a type of understanding that helps him to better interpret the historical record. So it would be no great loss then to concede that rather than having a single military culture stretching across thousands of years, China in fact has had many such cultures, most of which have long since gone extinct, leaving only traces of their former importance embedded deeply within the historical record. Understanding ancient Daoist practices is just not that central to solving mysteries in the realm of archaic military history. Again, this is correct as far as it goes. Yet I think this sort of reading also misses some of the real grandeur of Lorge’s project. In fact, there are important points of continuity within the martial arts that do span the millenniums. And there are very good reasons why modern martial artist might want to know about ancient history. The problem is that, generally speaking, they are looking at the wrong things. Modern martial artists seem to be obsessed with techniques, and yet this is probably not where one is most likely to find continuity with the ancient past. There are multiple reconstructions of how dagger-axes might have been used in combat, but its all guess work. Bronze “long swords” (which ironically are quite short by modern standards) resemble in some way late Qing military jians. These short, heavy, double sided swords seem to have been issued to village and clan militias in great numbers in the tumultuous 19th century. Yet there is no reason to believe the techniques for the use of the later weapon owe any debt to the former. There is just too much time separating them. However, the written Chinese language shows a surprising degree of continuity over this exact same period of time. Throughout his work Lorge makes a point of demonstrating that the trope that all martial artists were illiterate and left no literature behind is simply false. Certain martial artists were very literate, and they did leave behind accounts of their activities and lives. Future generations of martial artists often relied on this material when constructing their own ideas about what “martial virtue” was and should be. The stories that the noted historian Sima Qian recorded of ancient knights errant and assassins, as well as the many instances of heroic poetry that survive from ancient times up through the Tang, helped to lay the foundation for the creation of an alternate set of cultural values that would arise time and again in the different incarnations of China’s martial cultures. While the specific technologies of violence may have disappeared, at least some of the literature which they inspired lived on. While the different eras of China’s martial arts history and culture were all distinct, and all included truly new and innovative aspects, they shared this common body of stories and literature. In critical ways this textual tradition informed both the world view and self-image of later martial artists. So while the martial arts have been going through a constant process of revival and reinvention for the last few thousand years (often taking on unique expressions in different regions or localities), there has been a surprising degree of consensus on what exactly they are attempting to recapture. This is the overarching conversation that seems to run through history of China’s martial culture. Again, the issue of historical continuity is difficult. Did a Qing mounted-archer really develop the same mental skills and sense of spiritual balance as an ideal Shi from the Warring States period? These are such subjective questions that I think they are basically impossible to answer. Yet it is important to realize that educated military officers, or members of the gentry responsible for raising local militias, would have been familiar with these ancient traditions, and likely would have attempted to inculcate some versions of them into their own soldiers. Students of Chinese martial studies are thus left with a paradox. On a technical level each era of Chinese military history could be very distinct. Heavy cavalry comes and goes. Sometimes spears rule the battle field, other times its halberds (pudaos). In some eras crossbows are an essential military technology, while in others they play a distinctly secondary role. Geography and local history are always important variables to consider. Yet an argument could be made that all of these various observations are simply different expressions of a single martial culture attempting to replicate itself, and its essential values, over time. Occasionally new elements were introduced to this culture (often by the nomadic peoples from beyond the northern border of the empire), but the preservation of a core set of cultural values has always been important. One can certainly argue as to how well later generations really understood and succeeded in replicating these ancient martial values. Yet it is critical to realize that this effort is part of the modern martial arts. It is also interesting to realize that the subaltern discourse preserved in the “Rivers and Lakes” of martial culture (something that “good society” usually frowns on and attempts to marginalize) might in fact be some of the oldest cultural traditions in Chinese society. None of this would be possible if not for the continuous transmission and study of an ancient, widely dispersed, literary canon. It thus becomes absolutely vital to admit that not all martial artists were illiterate. Further, even illiterate ones likely had entire books from the classical library, as well as many operas and stories, committed to memory. The modern study of Chinese martial culture differs from its predecessors precisely because it takes this literary heritage as the starting point of its investigation. Far from being devoid of useful information, the Chinese textual tradition has a lot to teach us about the development of the martial arts. Whatever their specific theoretical differences (probably stemming from slightly different ideas about how we should define the “martial arts”) both Shahar and Lorge share the same basic methodological approach to the subject. This is a marked departure from previous generations where researchers like R. W. Smith tended to view the world of hand combat as a totally oral phenomenon, and thus relied on the testimony of their “informants” while neglecting the contents of the local library. On methodological grounds alone, both of these authors make it clear that the field has made progress, and the insights gained from this new approach are being rapidly consolidated. 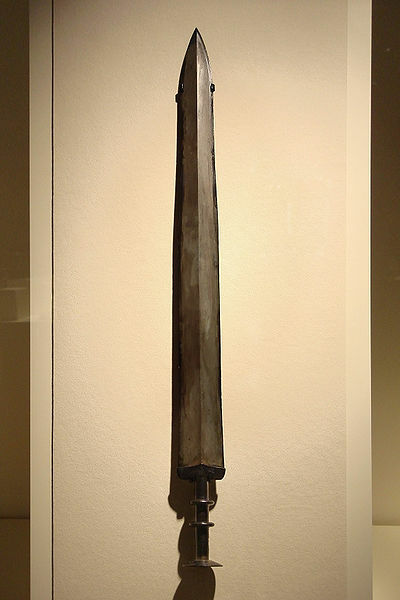 A bronze “long sword.” These were eventually replaced with longer steel swords during the Han dynasty. However, the truly ancient fencing styles of previous eras presupposed short, double edged weapons like this. This one is likely in excellent shape because the blade was coated with a thin layer of a sophisticated alloy to prevent corrosion. Source: Wikimedia. The Chinese Martial Arts: Structure, emphasis and recommended readings. Each of the chapters in Lorge’s books follows the same basic outline. Chapters are arranged chronologically and correspond to certain eras of Chinese history. In each of these he examines questions relating to the military of the day or other important social institutions, the evolution of weapons (archery, swords, spears), unarmed fighting (wrestling, boxing) and other issues of special interest. This last category is where many of Lorge’s most interesting points arise. He seems to be quite interested in the question of gender as it relates to the martial arts. Further, there turns out to be more variability in this category than one might expect. Another issue that he returns to throughout his manuscript is the question of personal choice and the radically contingent nature of history. This is quite interesting as much of this book deals with the evolution of technology. That can be a tricky thing to write on. Technological histories very often take on a sense of “inevitability” where vast unseen forces are pushing humanity from a low starting point to some natural conclusion. Marxist historians have traditionally seen the evolution of technology as an expression of the “historic forces of production,” a major engine of human growth. It goes without saying that the Marxist perspective colors a lot of the historical scholarship that has come out of mainland China over the years. Lorge’s own perspectives on these issues are quite different. Rather than seeing individuals as puppets which are possessed by historical forces, he gives them quite a bit of agency to make decisions that will radically change the course of the development of the martial arts, or even Chinese history. I suspect that I am sensitive to this issue because I am political scientist by training, and it bothers me when history is written in such a way that the agency of actors is ignored. I quite liked how Lorge handled a number of these questions. If you are new to the field of Chinese history generally you might want to pick up a couple of general historical text as you read through this book. As I mentioned previously, Lorge does not stop to explain much about the general framework as he confines his remarks mostly to the martial realm. His narrative is easy to follow, but readers with broader social question might wish to consult any edition of Patricia Buckley Ebery’s Cambridge Illustrated History of China (Cambridge UP) or Fairbank and Goldman’s China: A New History (Harvard UP). All of the basic military history that Lorge relates in the first half of his book can also be seen in these works, but they concentrate much more on broader social, cultural and economic issues. 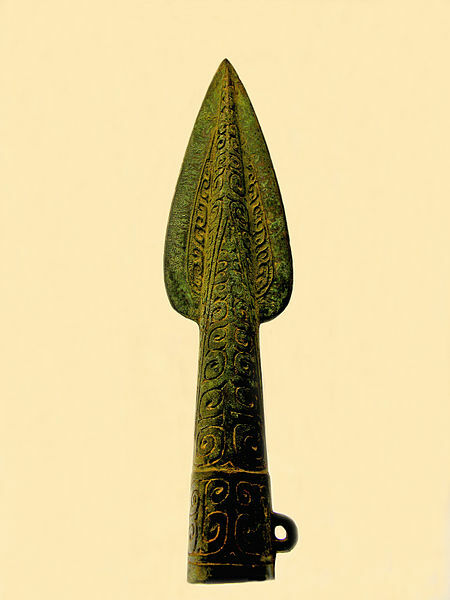 A highly ornate bronze spear, 6th-5th century BCE. As the militarized nobility was replaced with tightly packed mass infantry, if became impossible to swing a Ge. The more linear spear worked better in tight ranks and it quickly came to dominate the battle field. It would retain its preeminent position in Chinese warfare until the middle of the 19th century. Source: Wikimedia. Lorge’s work is a great contribution to the field of Chinese martial studies and I would not hesitate to use it in the classroom or recommend it to an informed martial arts practitioner who wanted to know more about the subject. Even if one already has an extensive academic background in this area, this volume is well worth the read. When reading the early chapters of his work, it is actually just as important to consider how he makes his arguments as what he says. Our total knowledge base for these early eras is quite limited. To be totally honest, I don’t think you will find anything in Lorge’s discussion of the early imperial period that is not also in a general reader like Ebery or Goldman. Obviously this changes as we get into the later chapters and the existing historical record becomes broader and deeper. But the first part of this book is where he lays out his methodological approach and establishes his concepts. So these are the issues that a reader will want to pay special attention to. The next installment of our discussion of Lorge will cover only Chapters 6-8 (the Sui, Yuan and Ming dynasties). In this era we will see the first building blocks of the modern Chinese martial arts (which exist today) being laid. For that reason this period (specifically the Ming) is often of great interest of students of hand combat. Having already discussed his theoretical and methodological position, our review of this period will focus much more on his specific arguments about the emergence of the martial arts. Following that, the third section of our review will cover chapters 9-10 (Qing though Post Imperial China). In my view, this is the era that is the most critical to understanding the Chinese martial arts as they actually exist today. We will devote the final section of the review to an examination of how Lorge approaches these topics. Click here for part II of our review, chapters 6-8 (Song-Ming dynasties). Well, as a sinologist with the same qualifications as Lorge plus more than 25 yrs. of practical CMA experience, I don’t share your few as I was rather disappointed by this work. It’s neither a real military history nor an indepth MA history, uses not enough available sources, shows a strange selection of pics, and in places is just wrong, e.g. the mongols never favoured the straight sword. It may be a work for laymen, either sinologists without practical understanding or some MAists without Chinese reading abilities. It is nice that sinology picks up MA as a field of research, but the practical and the acadmic abilities need to come together in that field. I much more enjoyed Kai Filipiak’s works or case studies by Sahar or others. Thanks for stopping by and forcefully stating your opinion. Kai Filipiak’s work is great, and I certainly prefer the way that Shahar deals with certain developments during the the Ming. As I mentioned in my review, I think Lorge takes some cheap shots at him that are not adequately supported. But if you will allow me to press you further, where specifically does Lorge fail in the first half of this book? Is it in his selection of the audience? Should he have aimed his book only at specialists (I suspect that he could have)? Did he fail to do original research (a problem that others have certainly mentioned)? Should he have focused more on archeology and less on documentary history during the early period (something I expected he would do)? What specifically would you have done differently? There is certainly enough room for more than one book on the CMA out there, so what would yours have looked like?